Ohio State senior goaltender BRADY HJELLE (34) watches anxiouxly as the Buckeyes’ Canadian legionnaire JUSTIN DA SILVA (25), the 22-year-old sophomore defenseman from Cambridge, Ontraio, clears the puck away from Notre Dame captain ANDERS LEE (9), the junior center from Edina, Minnesota, who was chosen by the New York Islanders in the sixth round (# 152 overall) of the 2009 National Hockey League Draft, during the CCHA tournament semifinal contest at the Joe Louis Arena in Detroit, Michigan. Sensational netminding from the senior who was chosen as the conference’s best goaltender on the season only the night before held the obvious underdogs in contention until the final period but a power play goal and an empty net strike put an end to all hopes of an upset as # 9 NOTRE DAME outlasted a defiant OHIO STATE 3-1 in the semifinals of the Central Collegiate Hockey Association’s last-ever playoff tournament. It was Ohio State, of course, who were the very first CCHA tournament champions back in the spring of 1972 and the Buckeyes, quite naturally, had been entertaining thoughts of bookend titles before its move next season to the new Big Ten conference. As a direct result of its record of 16 wins and 16 losses with seven ties heading into the semifinal meeting with Notre Dame in Detroit, the only path to the annual NCAA tournament for head coach MARK OSIECKI’s club was if Ohio State could somehow win the CCHA playoff tournament for the only third time in school history. 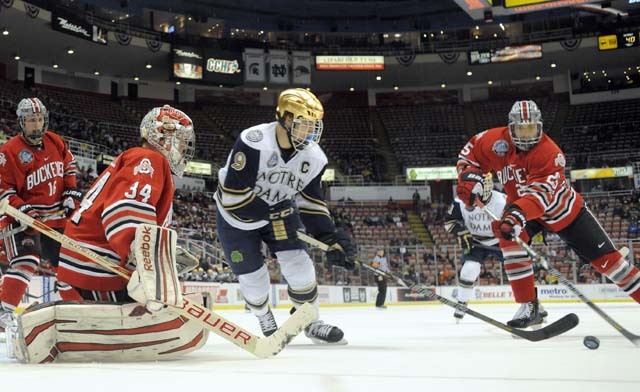 And so, the Buckeyes had everything to skate for at the Joe Louis Arena and remained unfazed even after the Fighting Irish came out flying in the first period. Indeed, it was Ohio State who grabbed the lead (very much against the run of play) roughly ten minutes into the game after leading scorer RYAN DZINGEL worked the old give and go with right wing ANTHONY GRECO, the 19-year-old freshman from Fairbault, Minnesota. In fact, the sophomore left wing from Wheaton, Illinois, who was the seventh round seleciton of the Ottawa Senators at the 2011 National Hockey League Draft netted his 16th goal of this 2012/13 NCAA season on the Buckeyes’ very first shot of this CCHA semifinal. Unfortunately for Ohio State supporters, however, the celebration would be quite brief. Sophomore left wing RYAN DZINGEL (18), the 21-year-old Illinois native who finished second in scoring (33 games, 7 goals, 24 points) for the Buckeyes as a freshman arriving from the Land of The Galloping Ghost, led the Ohio State pucksters with both 16 goals and 38 points in 40 NCAA contests this season. This because the Fighting Irish, who had already lost to Ohio State 6-3 a day before drawing 2-2 with the Buckeyes in Columbus earlier this season, struck back less than sixty seconds after falling behind in Detroit. 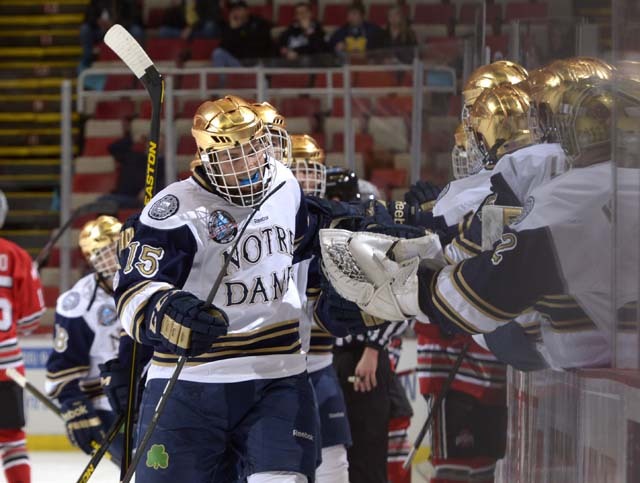 Significatnly, it was the checking line of Notre Dame that generated the equalizing 3-on-1 rush which Austria junior international PETER SCHNEIDER finished off perfectly with a low wrist shot. Quite some time would expire before Ohio State goaltender BRADY HJELLE, the 22-year-old senior from International Falls, Minnesota, would be beaten again, though. The Buckeyes’ current number one this term had appeared in only eight games (2.53 avg, .922 save pct) as a junior for Ohio State a year ago after transferring from the University of Minnesota – Duluth, who, ironically enough, won the 2011 NCAA national championship while Hjelle was sitting out the collegiate season and tending the nets for the Cedar Rapids RoughRiders in the United States Hockey League. Last year’s starter in Columbus was Cal Heeter (32 ga, 2.45 avg, .918 save pct), who is now guarding cages in the American Hockey League for the Adirondack Phantoms, the farm club of the National Hockey League’s Philadelphia Flyers. Finally given his chance at Ohio State, Hjelle responded with a standout effort (34 ga, 2.00 avg, .935 save pct) and was subsequently honored as the CCHA’s Best Goaltender for this 2012/13 campaign. Thanks in large part to a phenomenal effort from Hjelle, who finished with 41 saves in his final appearance for Ohio State, the Buckeyes went into the last period with Notre Dame and its dozen NHL draft picks all tied at one goal apiece. As a matter of fact, with only a bit more luck, Ohio State might have found themselves ahead in the second period after a backhander from left wing ALEX LIPPINCOTT, the homegrown junior from Akron who scored just once in 31 games for the Buckeyes this season, bounced off the post and rolled along the goal line. But it was not to be and Notre Dame goaltender STEVEN SUMMERHAYS soon recovered to neutralize the danger. 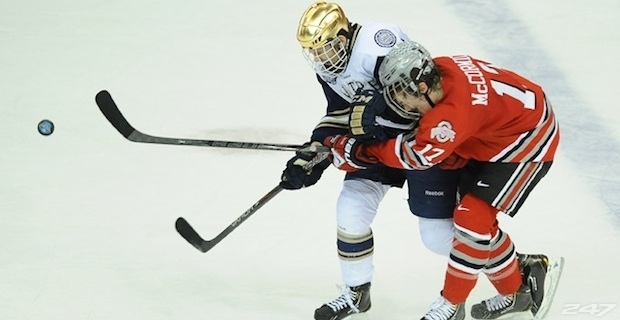 Notre Dame’s imported right wing PETER SCHNEIDER, the rugged sophomore who has represented his native Austria at the annual IIHF World Junior Championships on two occasions, delivers a devastating shoulder check to Ohio State left wing MAX MCCORMICK (17), the sophomore from De Pere, Wisconsin, who was the sixth round choice (# 171 overall) of the Ottawa Senators at the 2011 NHL Draft and the second-leading goal-scorer (15) for the Buckeyes this season, during the CCHA semifinal clash at the Joe Louis Arena in Detroit, Michigan. Notre Dame right wing PETER SCHNEIDER (15), the 21-year-old sophomore who comes by way of Vienna, Austria, and is only the third European native to ever play NCAA ice hockey for the Fighting Irish, bumps fists at the bench after scoring a big goal against Ohio State in the first period of the CCHA semifinal at the Joe Louis Arena in Detroit. 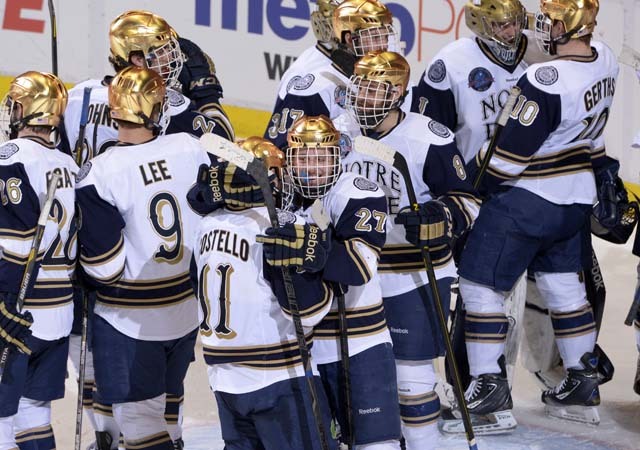 Notre Dame, who would limit the stubborn Buckeyes to just seventeen shots on target for the entire CCHA semifinal contest, finally broke through early in the third period after Ohio State right wing DARIK ANGELI, the undrafted sophomore from Lakewood, Colorado, was sent to the penalty box for interference at the two-minute mark. Center T.J. TYNAN, the 21-year-old junior from Orland Park, Illinois, who was chosen by the Columbus Blue Jackets in the third round (# 66 overall) of the 2011 NHL Draft, skated in from the point and threaded a shot past Hjelle to give the Fighting Irish its very first lead of this CCHA semifinal. The Buckeyes had managed to stay even for the first forty-four minutes but, for all its bravery on display at the Joe Louis Arena, never did really look like mounting a sincere rally. 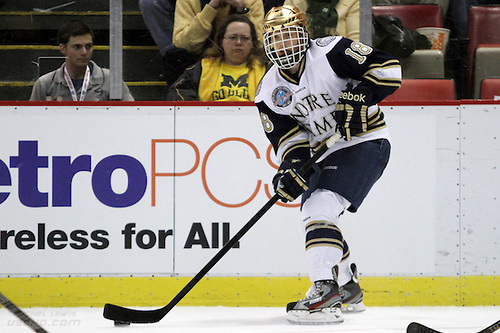 Notre Dame left wing JEFF COSTELLO, the junior from Milwaukee, Wisconsin, who was the fifth round pick (# 146 overall) of the Ottawa Senators at the 2009 NHL Draft, wrapped things up for Notre Dame by shooting the puck into Ohio State’s empty net with roughly a minute to play in Detroit. 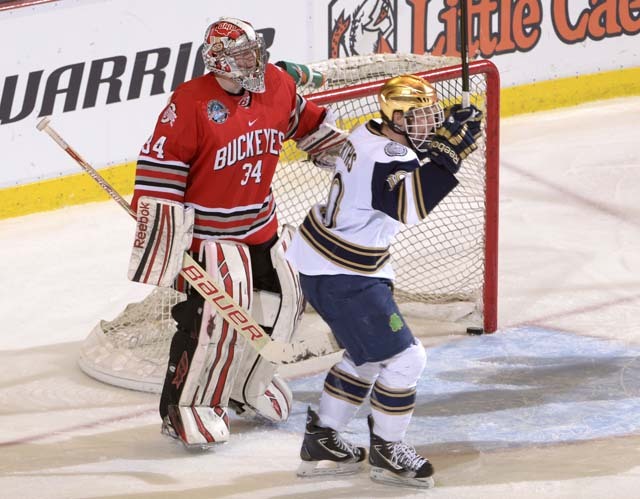 Ohio State’s beleaguered netminder BRADY HJELLE (34) despairs as Notre Dame center DAVID GERTHS (10), the decently-sized (6’0″ 217 lbs) but undrafted junior from Ankeny, Iowa, raises his stick to signal the decisive early third period power play goal scored by the Fighting Irish’s not-pictured T.J. Tynan during the CCHA playoff semifinal contest watched by a crowd of 10,164 spectators at the Joe Louis Arena in Detroit, Michigan.